If you thought the last post was challenging, try this. Cultural Gothic, by Paul McCarthy, an LA artist, is another provocative piece in the Rubell Collection. 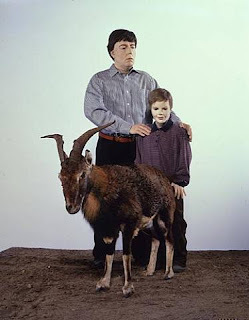 It is a motorized sculpture of a father and a son sodomizing a goat. The mechanics of the sculpture was not working when i saw this piece, but the son is supposed to move back and forth, then look back at his dad, and the dad is to nod his head as if he is approving. There is a reference to the famous painting American Gothic by Grant Wood. But here, the artist is giving a post-modern treatment to a common rural practice. The twist is that the father and son seem to come from an urban setting (ok, may be suburban), seen in their conservative clothing. This contrast makes you think about how the physical appearance may fool you about a person or an object. You don't know the dirty secrets behind the veneer.